During WWII, the government required all males age 18-64 to register for the draft. Registrations were conducted in several rounds, the fourth of which was for those age 45-64, often referred to as “The Old Man’s Draft”. Registrants of this age group were not expected to serve in the military, but to be on hand in case their labor or skills were needed for the war effort. Even small communities had a draft registrar, and in fact Funter Bay had two. 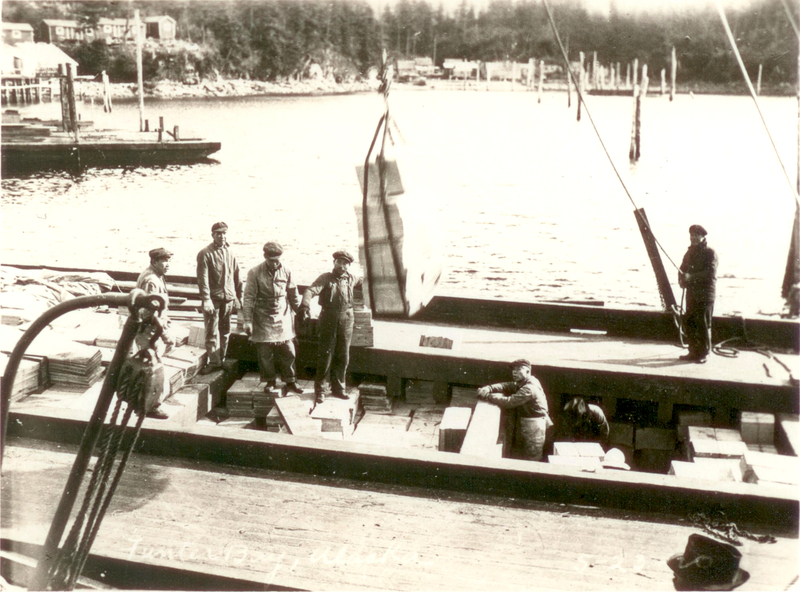 Postmaster Harold Hargrave handled registrations for local fishermen and miners, while Pribilof Island internees were registered by Lee McMillan, a Fish & Wildlife Service employee. 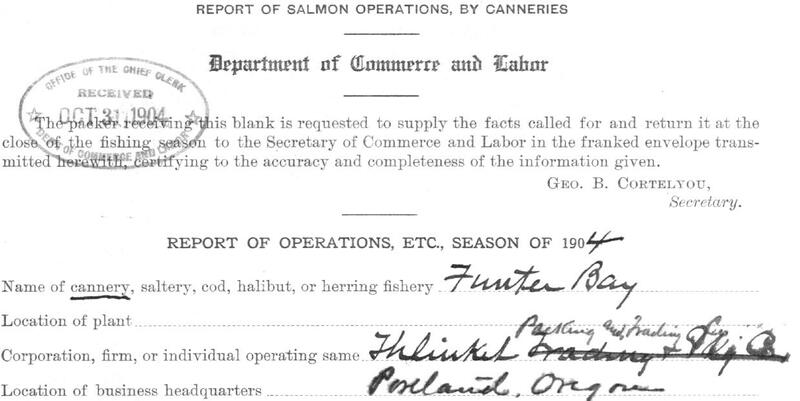 Registration for the 4th round was begun in April of 1942, Funter Bay registrations seem to have occurred between May and September. I have found records for 29 individuals registered at Funter (again, these were only men age 45-64). I’ve typed up the records from these draft cards below. The name in parentheses is the person listed as “Person who will always know your address”, if there is no last name in parentheses it is the same as the man listed in that record. If the card is noted “Deceased” or similar, I have also noted that after the names. Spelling of some of the place names is taken from the cards and is not always correct or consistent. The date of birth listed on the cards may not be 100% accurate, as people did not always recall their exact age. The last line of each record is the employer or business listed on the card. 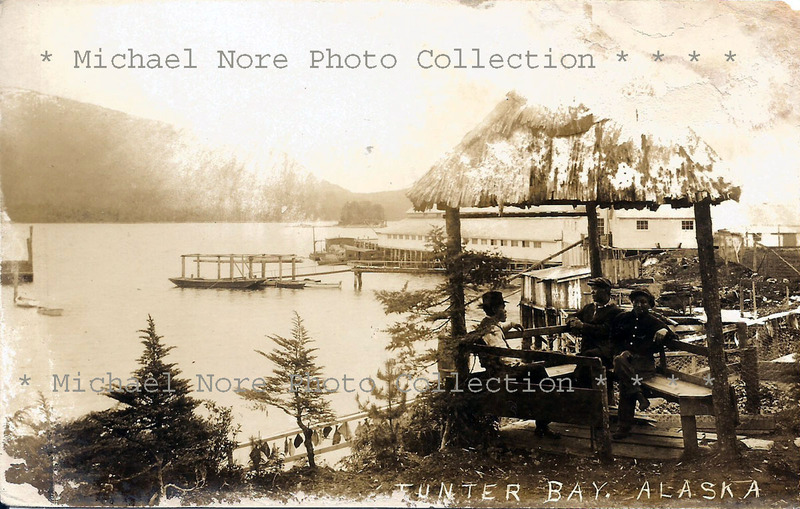 An article in the January, 1906 issue of Recreation magazine describes a visit to Funter Bay. 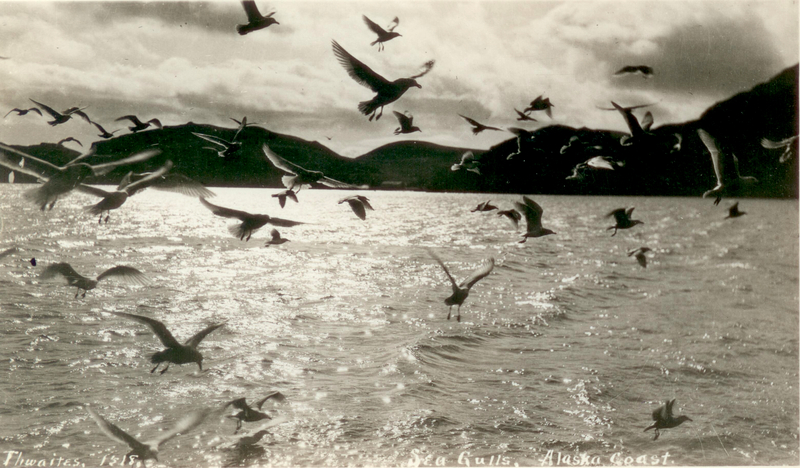 Mining Engineer Waverley Keeling penned the piece, entitled “From the Delaware to Alaska” from a bunkhouse in Funter Bay. He describes it as a business stop at “a quartz mine”, but mentions that his party would also “shoot some of the thousands of ducks and a few deer, dig clams at low tide, and catch halibut at any tide”. From Keeling, Waverley; “From the Delaware to Alaska”; Recreation, vol 24, No 1, January 1906. 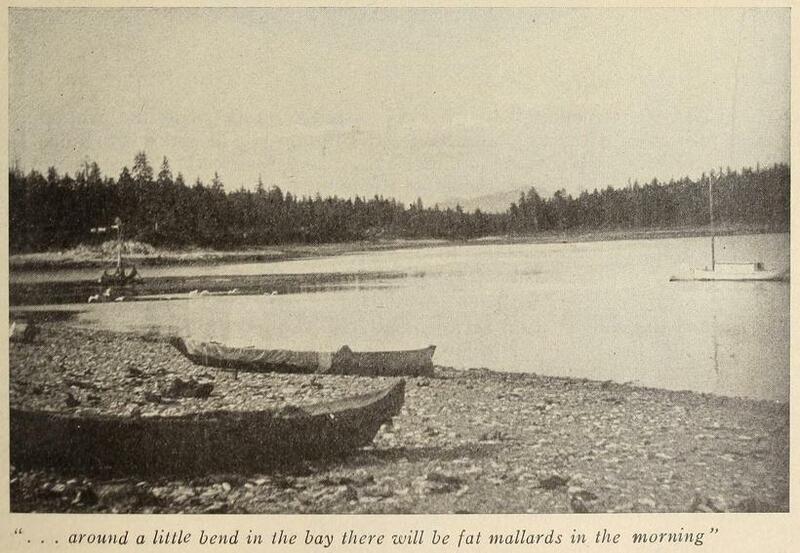 The photo from Funter Bay accompanying the text appears to show Coot Cove. The photographer was on the Western shore looking towards the area which would later be home to the cannery’s scow slipways. Keeling describes his lodgings as a boarding house “near the shore of a beautiful little harbor called Funter Bay, and just back of us are the peaks of Snow Mountains some 4,000 feet high” (The mountain was not yet named for Robert Barron). He wrote from the combined kitchen and dining table, by the light of a large swinging lamp and tallow candle stuck in a beer bottle, sitting on “the hardest spruce-board stool that man ever constructed”. The group of six had purchased mining properties around Lake Atlin, BC, and had stopped in Funter as a side trip on the way North. They sailed to Funter on the “big Columbia River sailboat of that famous southeast Alaskan, Windy Bill”. While Keeling notes the beauty and abundant wildlife of Funter Bay, he also comments on the downsides; “there is no particular season of the year when it doesn’t rain. The thermometer at Funter Bay since we came has been up to 40, and the rain which descended that day was as unmistakably an outpouring of ‘settled cloudiness’ as anything I have ever seen or felt in Pennsylvania”. 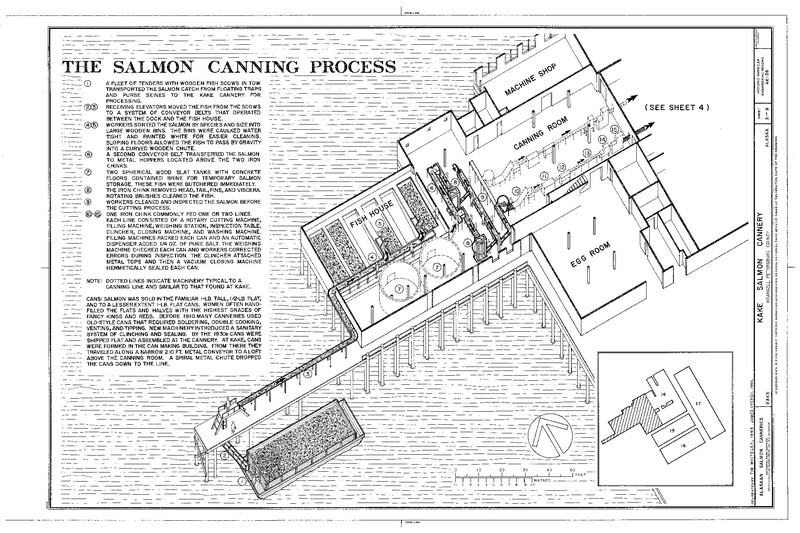 I have previously mentioned some of the techniques and methods involved in early 20th-century cannery operations, but this post follows the entire salmon canning process from the ocean to the grocery store! 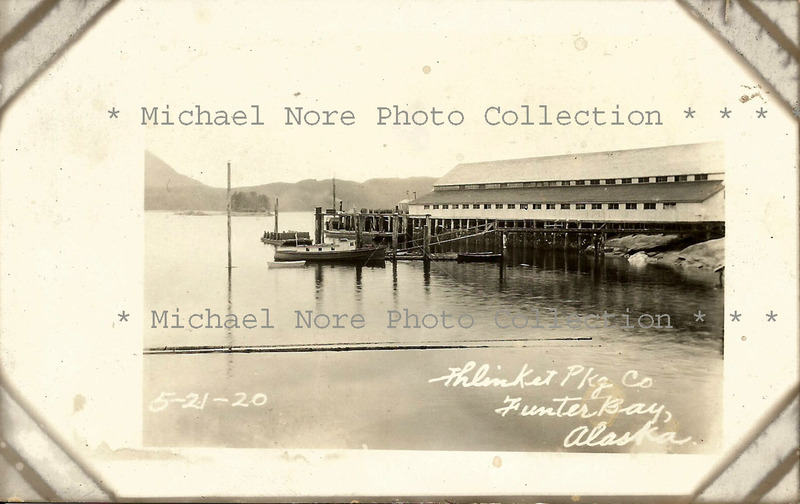 At Southeast Alaska canneries like the one at Funter Bay, the first step was the fish trap, either the floating or pile variety (I discussed fish trap types and issues here, and have a location map here). 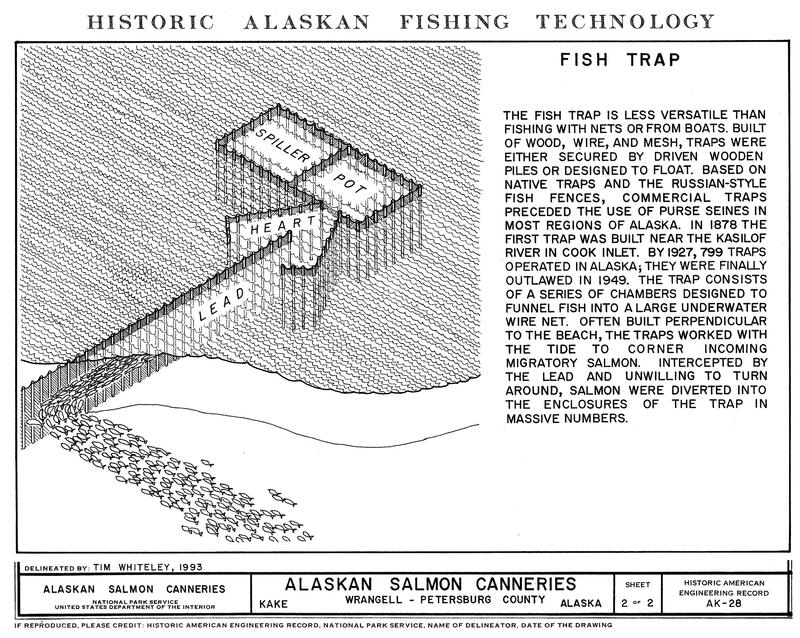 After the trap was filled with fish, it would be “brailed” or emptied into a scow (barge) by lifting the nets and dumping the fish. I previously posted a set of postcard images showing this process here. Courtesy of Historic American Engineering Record, National Park Service, Tim Whiteley and James Creech, 1993 & 1995. 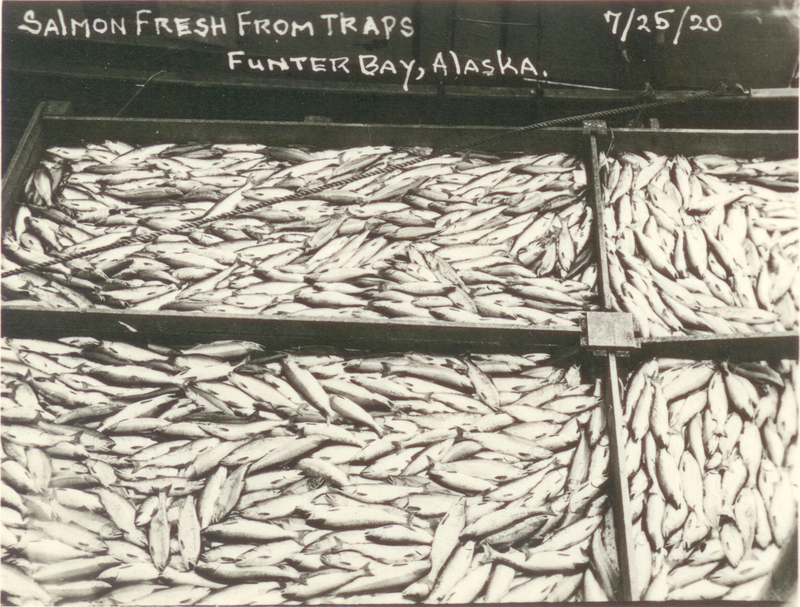 Once at the cannery, the fish were unloaded by hand into a “Fish Elevator”, an angled conveyor belt which moved them up to the level of the processing line. 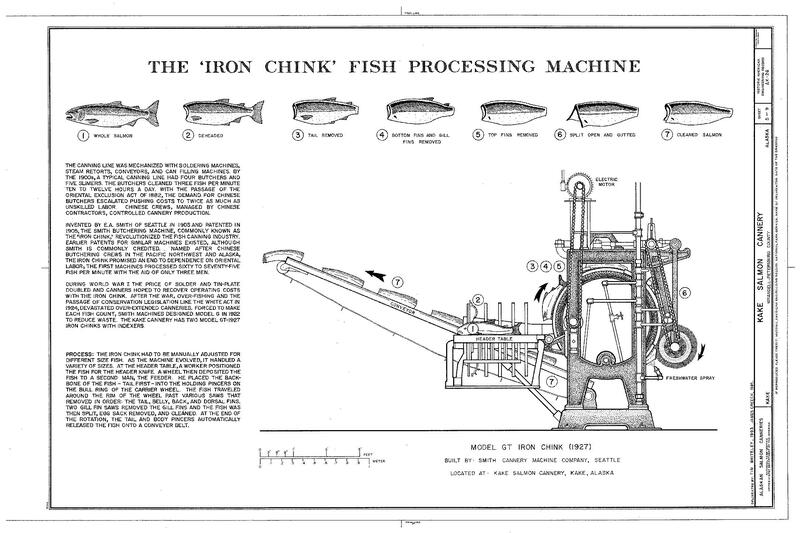 A video clip of such a fish elevator in action can be seen here. 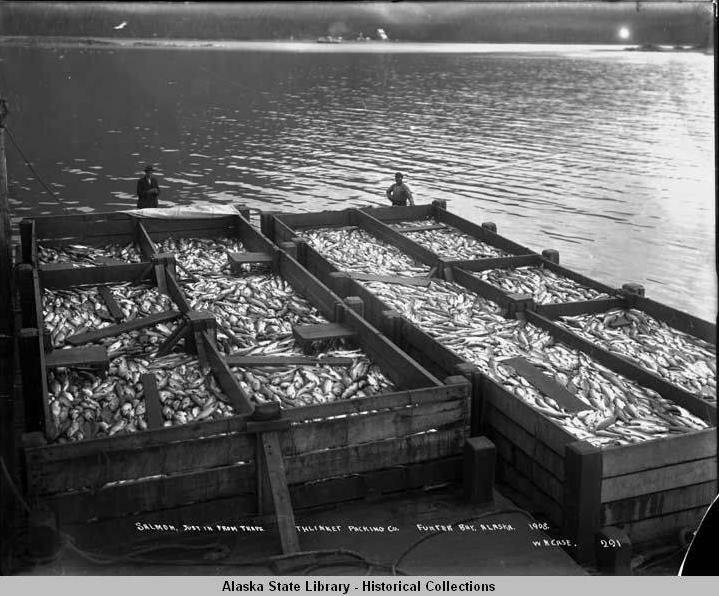 The salmon were then sorted by species (unwanted bycatch fish were usually discarded at the scow before loading onto the elevator). 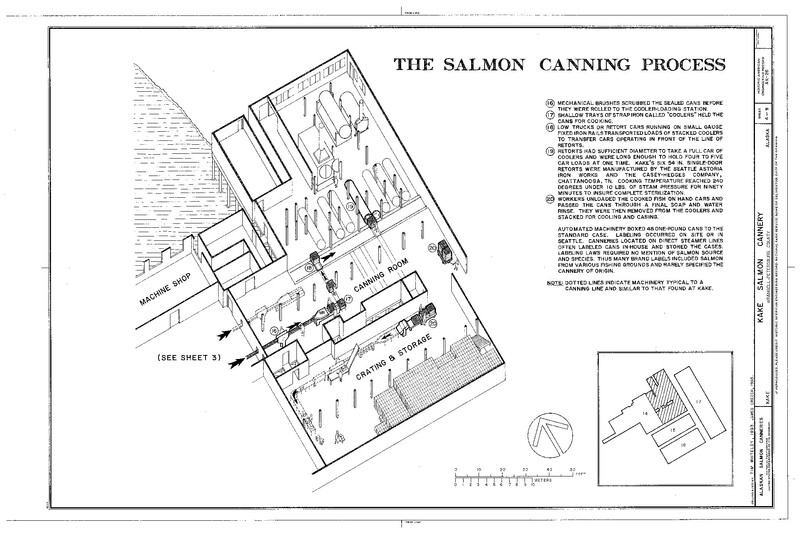 The sorted salmon were run through the canning line one species at a time, each species typically had its own brand and label. First the salmon were cleaned and dressed. Originally this was done by hand with a crew of laborers (often Chinese, Japanese, or Filipino, although the Thlinket Packing co initially had many Tlingit Native employees). 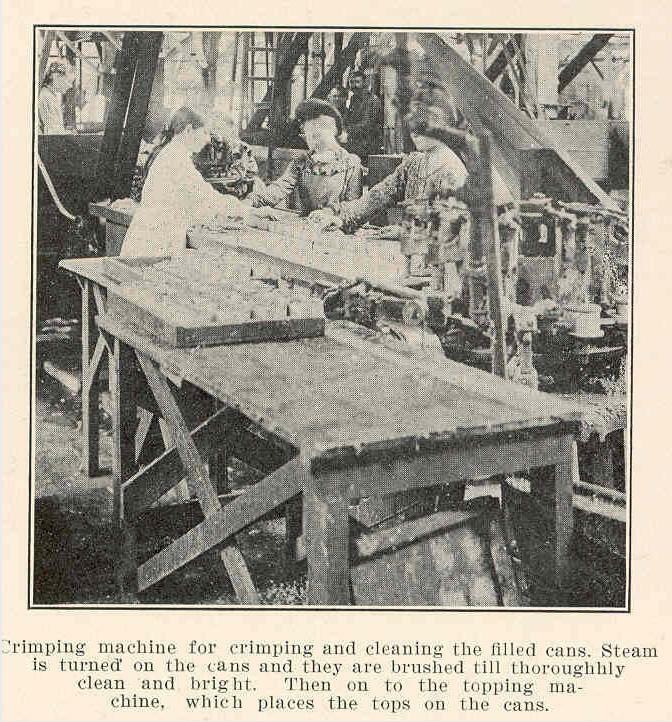 Later the cleaning process was automated, with an unfortunately-named device replacing many of the labor-intensive steps in preparing the salmon. During the fish cleaning process, offal (heads, gills, and guts) was conveyed to a waste bin. It was later loaded back into empty scows for disposal, as seen in this post. A small amount was sometimes sold to fur farms to feed fox and mink, but most was simply discarded. This is still commonly done in many canneries. The hills in the photo below seem to match the head of Funter Bay, this could have been taken while dumping fish waste near the mouth of the bay. 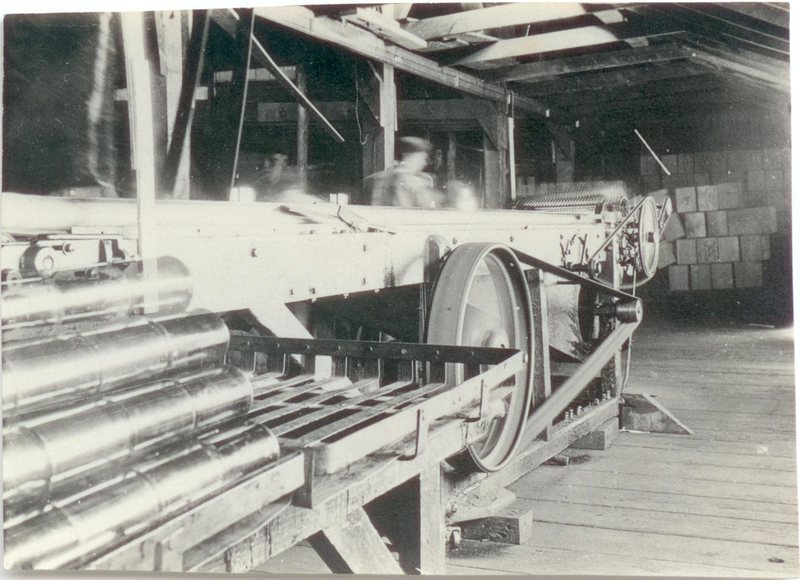 The following five photos are from a standard cannery of very similar design to the Thlinket Packing Co’s Funter Bay plant. These are from the Pacific Fisherman Volume 4 Annual Yearbook, of 1906, and are used as public domain per the Freshwater and Marine Image Bank’s policy. 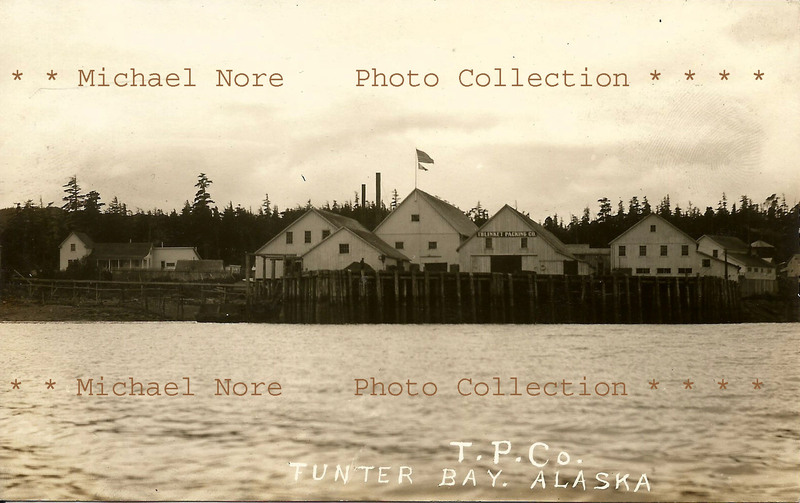 The article describes this as a cannery in Puget Sound, although one of the photos used in the article is also labeled on a postcard as “Robert Barron’s Cannery” of “Fonters Bay”. 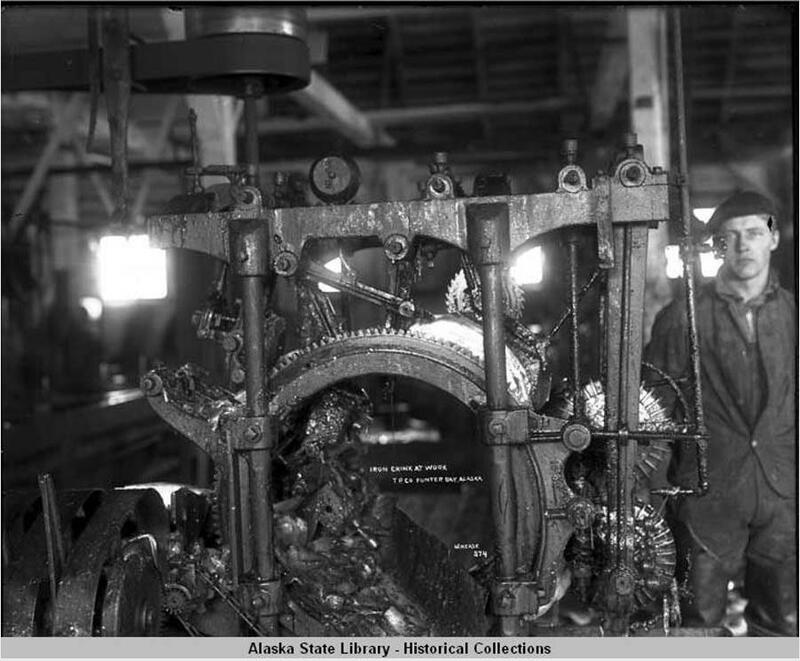 After cleaning, the next step for salmon bodies was cutting, originally by hand and later done by a mechanical gang knife. This sized the fish appropriately to fit in cans. Cans were filled, crimped, washed, topped, and soldered shut. Again, more and more of this process became automated over time. The soldered-shut cans were cooked in a retort, essentially a large steam pressure cooker (a small vent hole was left in the can during cooking, and soldered shut afterward). At the Washington cannery this was done for 1 hour and 15 minutes at 240 degrees F and 15psi. After being removed from the retort and given time to cool, the cans were run through a labeling machine to receive the appropriate label for the species and brand. Quality control workers checked the weight and seal at various points during the process. Some can labels from the Thlinket Packing Co are seen in this post. Finished cans were packed into boxes built from prefab sections and assembled at the cannery. 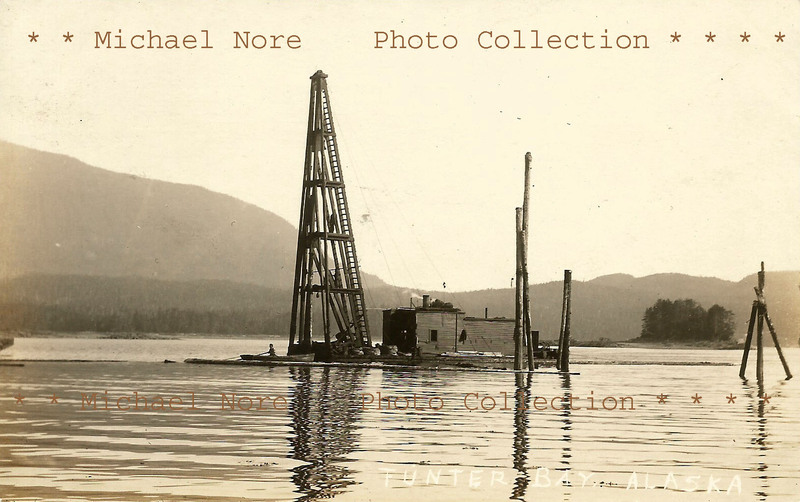 The next two images were in a batch of photographs from Funter Bay, taken around 1919. 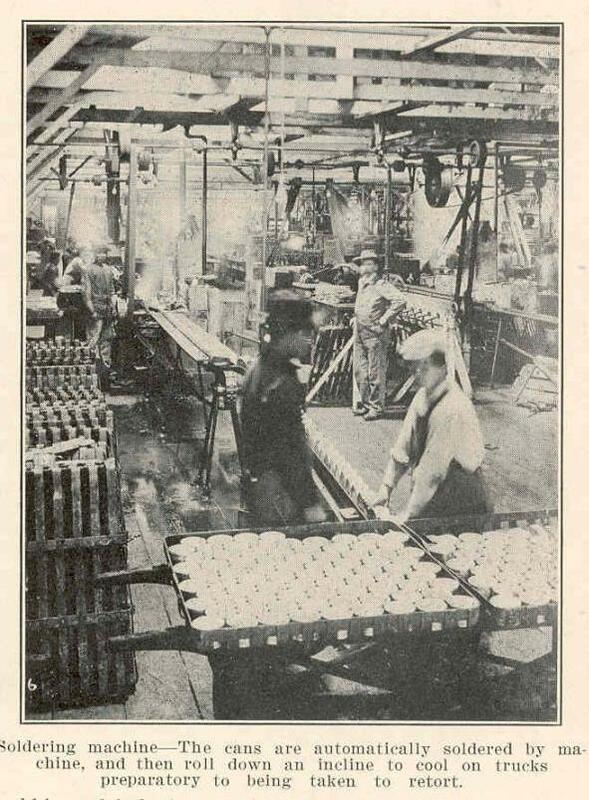 The first photo appears to show cans moving through some machinery (perhaps the soldering machine) and stacking up on a cooling rack prior to being loaded into a retort for cooking. The exposure is long enough that the top row of cans appeared on the pile while the shutter was open (they look transparent). People moving in the background are also blurry. 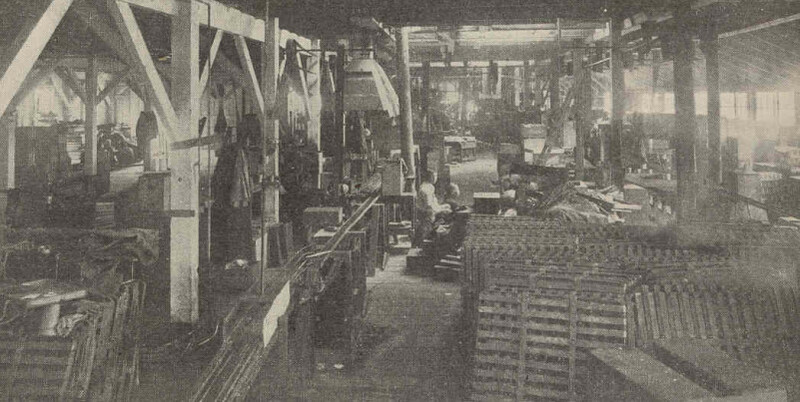 Assembled wooden boxes are seen in the background. 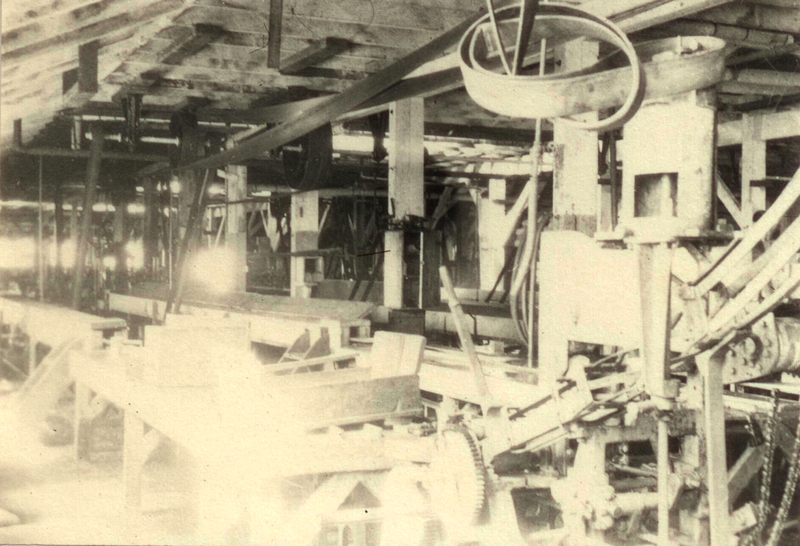 The next photo is a little harder to make out, but includes an angled ramp on the right hand side, similar to the can filler machine. Empty cans were stored in the loft above the canning floor, and dropped down to the working stations through these ramps. Overhead belts fed power to the equipment from a central engine. A spare belt is seen wrapped around the top of the machine. The interior of the T.P. 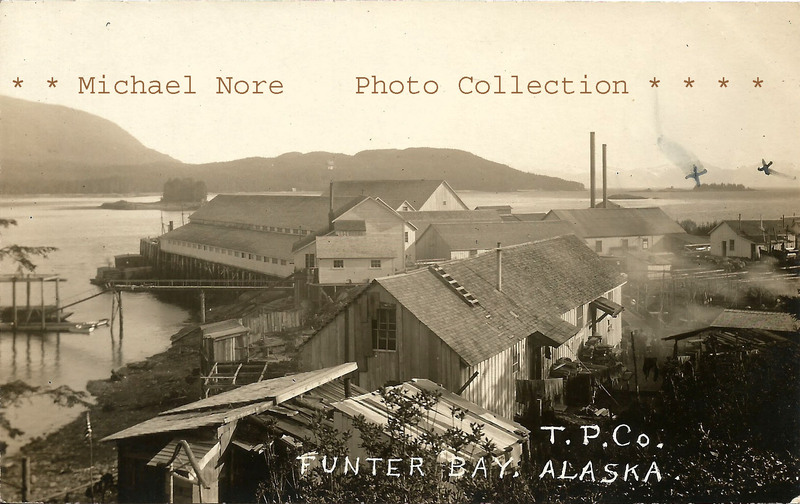 Co Cannery at Funter is seen in this 1907 image (below). Metal cooling racks are stacked on the right, while conveyors are in the center. A vent hood near the middle could be a soldering station. 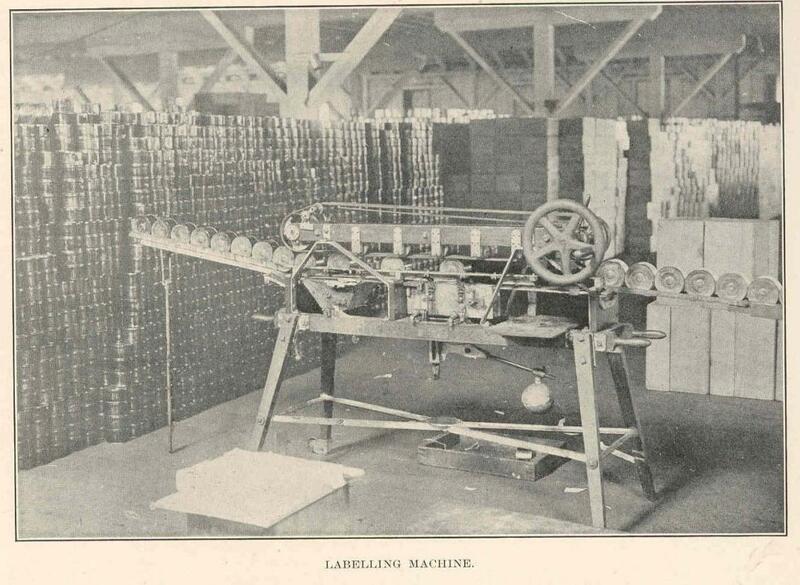 A slightly different version of this image labeled “Interior Canning Department” can be seen here. Courtesty of UW Freshwater and Marine Image Bank. 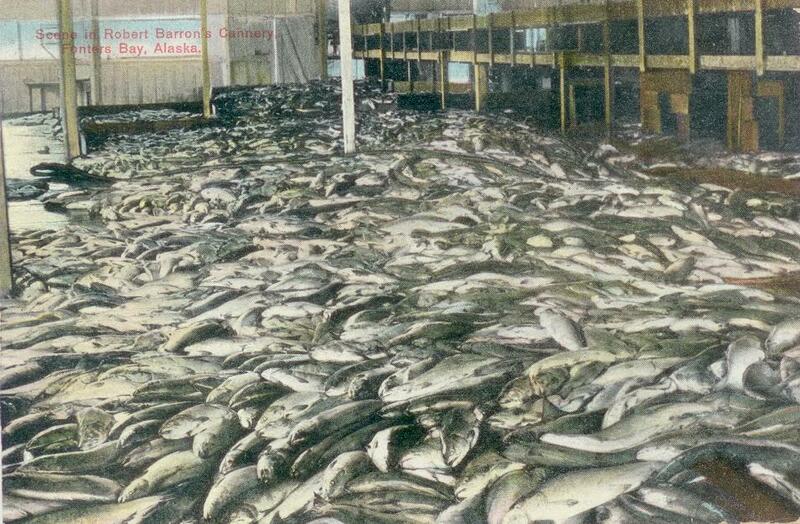 Another image from about the same time shows 75,000 cases of salmon in the Thlinket Packing Co’s warehouse. The cans have not yet been boxed up. Another warehouse view is here. Once packaged, the finished product was shipped South on commercial steamers or on freight ships owned by the cannery, to be sold to wholesale grocers for delivery to the consumer. Salmon in a can would appear on the shelf much as it does today, in fact the colors and art used on labels today is very similar to that of historic labels. 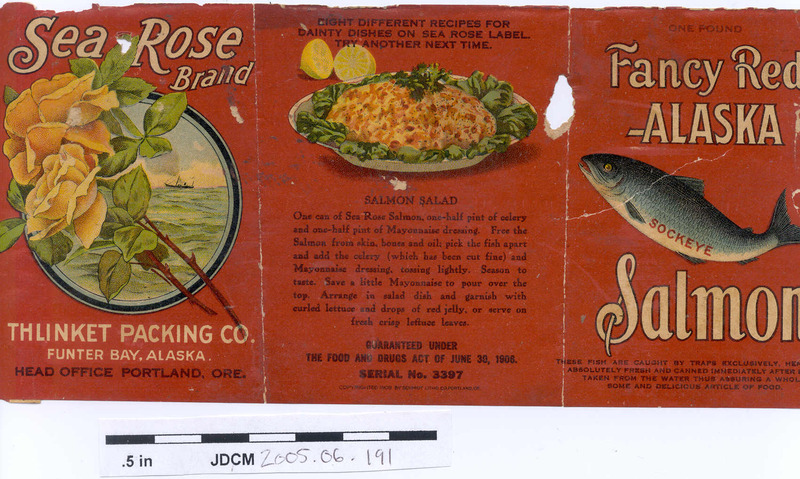 Sea Rose Brand Salmon Label from Thlinket Packing Co., c. 1905. 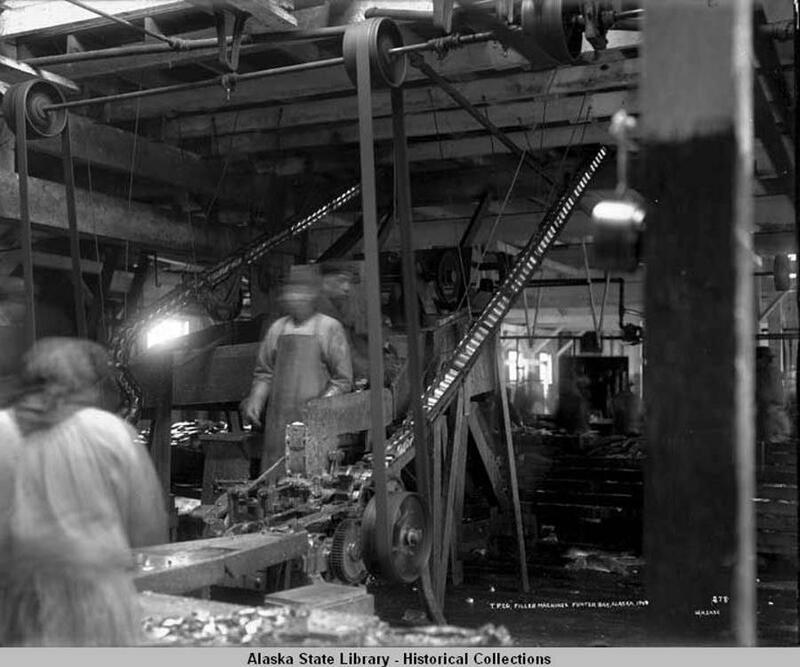 Image courtesy of the Juneau-Douglas City Museum, 2005.06.191. Modern salmon cans, photo by the author. 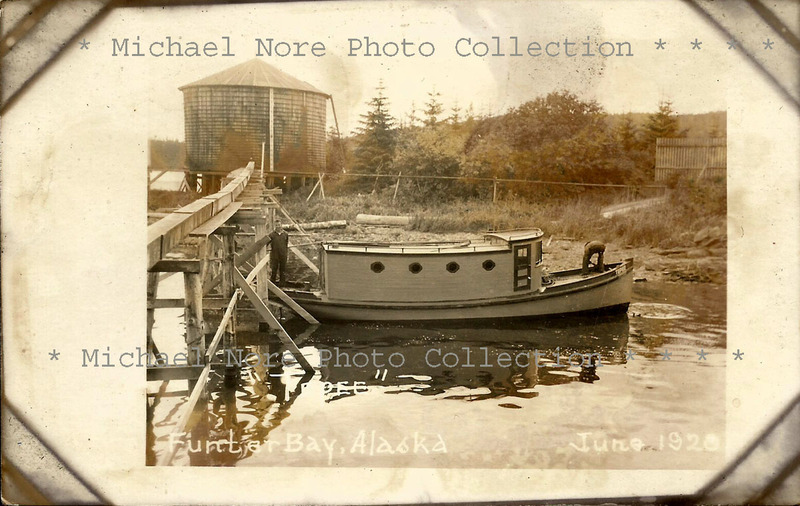 Some photos from July of 1920 show several of the cannery tenders (fish handling boats) and barges at the Thlinket Packing Co. Above, the Anna Barron maneuvers two loaded fish scows up to the cannery wharf. This vessel is discussed further here. 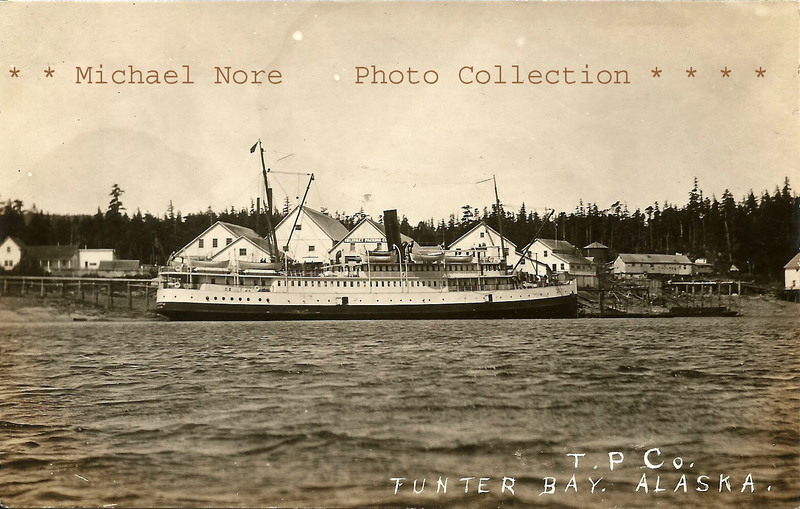 Below is another Thlinket Packing Co boat, the Barron F, seen in front of the cannery wharf with Highwater Island and Mt. Robert Barron behind. This 98-year-old boat is still working the West Coast, I have a number of photos courtesy of the present owner available here. 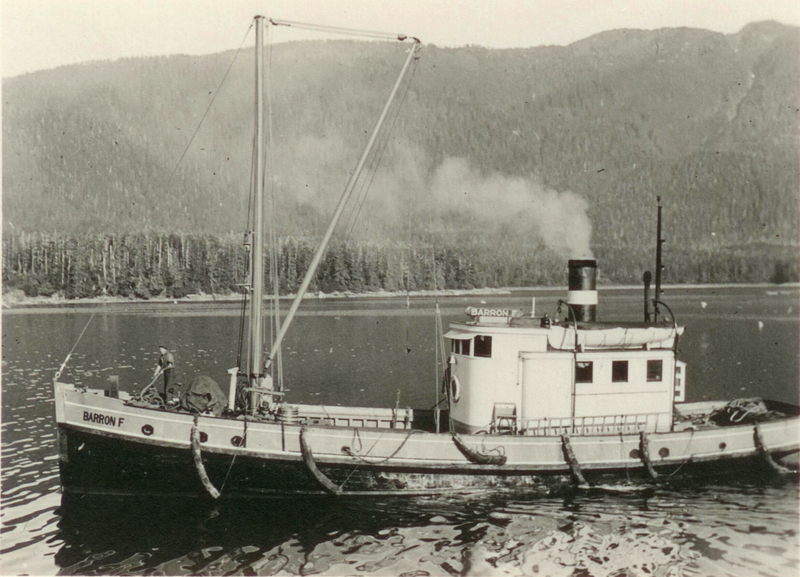 Unlike the Anna Barron, which was configured as a tugboat, the Barron F was a packer or cargo vessel with large midships hold. 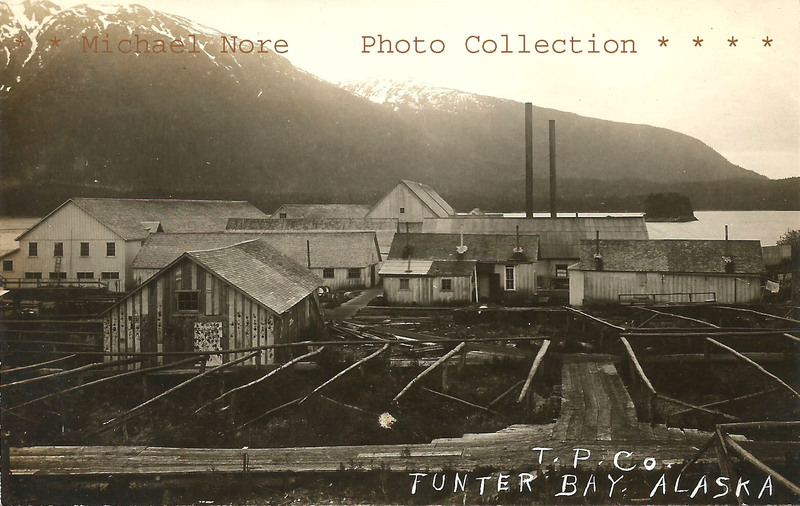 The Funter Bay cannery had several of each type of vessel, used somewhat interchangeably depending on the task at hand. 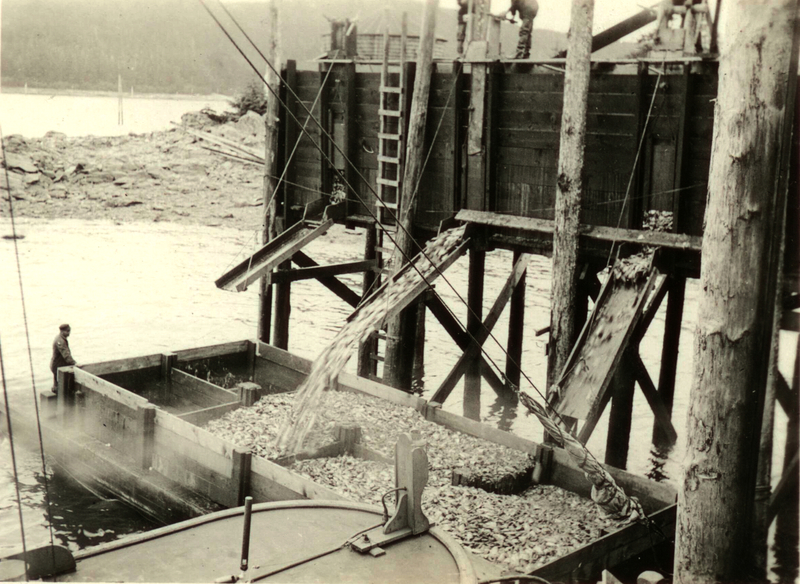 The next photo shows a scow, now emptied of salmon, being loaded with waste from the canning line. 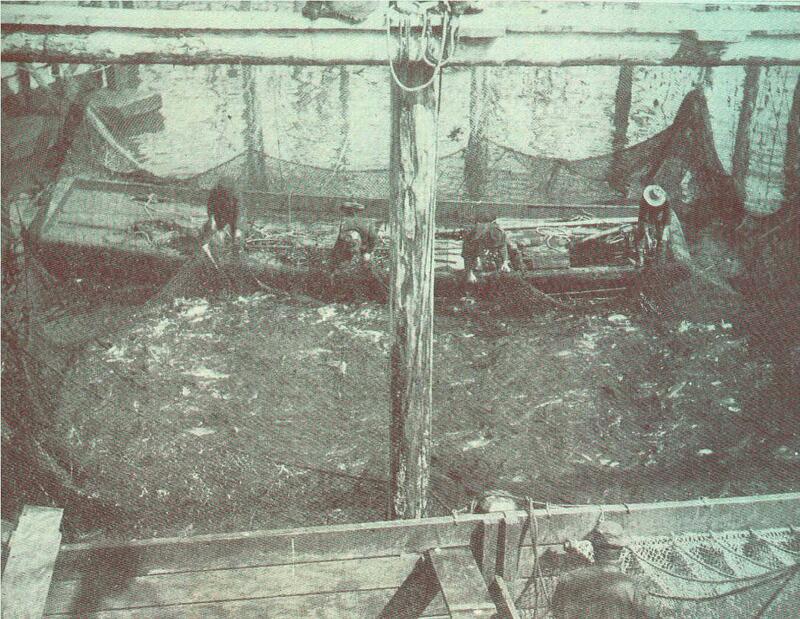 Elevated wooden bins held heads, guts, and other unwanted bits of fish until they could be dumped into a scow. The scow was then towed to deeper water and dumped. This kept the cannery smelling slightly better, with fewer bears nosing around, than if the waste were simply dumped directly in front. The cannery’s oil tank is visible on the point in the background. 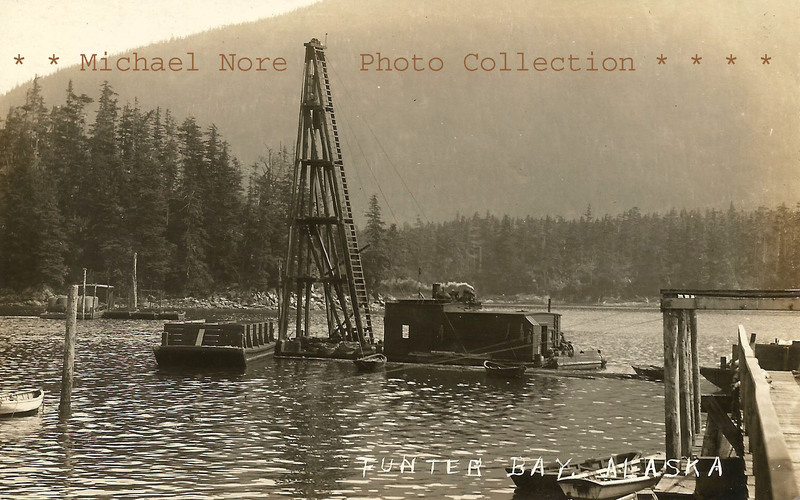 In the last photo, we see one of the cannery tenders towing a piledriver out of the bay. The profile of the vessel suggests it might be the Anna Barron. Smoke is coming from the pile driver’s steam engine, which suggests it will soon be at work on one of the fish traps outside the bay. 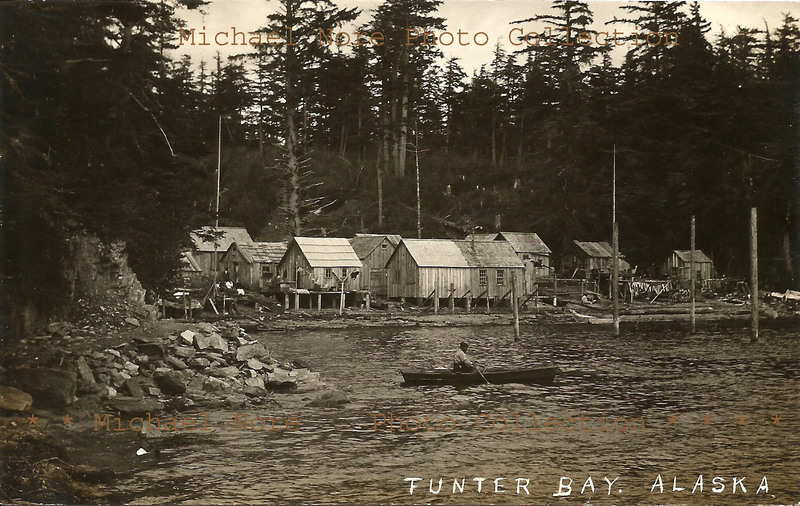 My last post displayed some 1920s-era postcards (RPPCs) from Funter Bay, showing buildings and boats of the Thlinket Packing Company’s salmon cannery. Other postcards from the same set show some of the workers and people associated with the cannery in the same time period. It is not clear if these are commercial mass-produced postcards or personal images printed on postcard stock. Here we see a group of men unloading items from the hold of a ship. The items are likely knocked-down cases for canned salmon. These would be assembled, filled with cans, and then shipped out again. An example of assembled cases can be seen here. 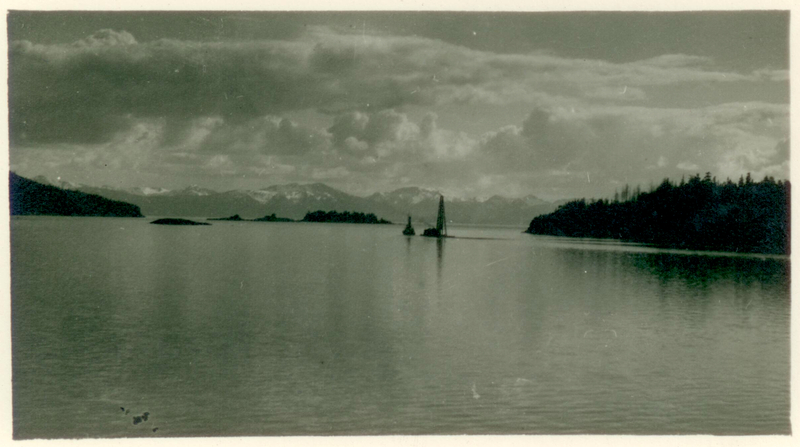 In the background are Tlingit native houses and a scow or barge. 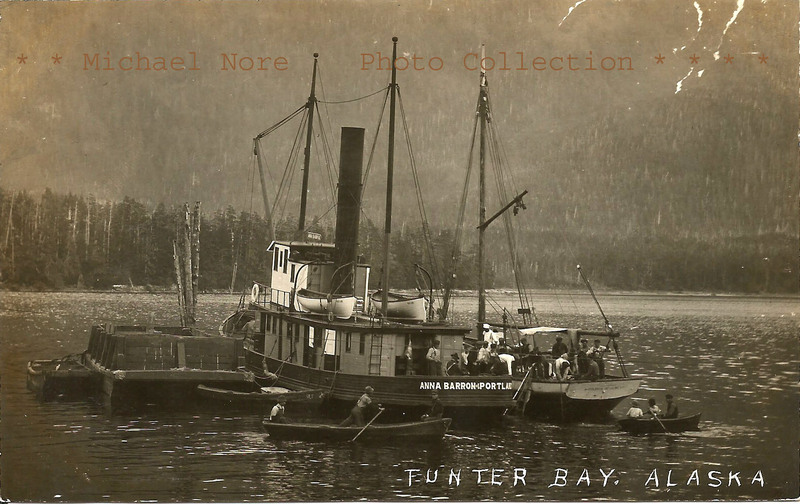 The next two photos are not labeled as Funter Bay, but were found alongside Funter Bay photos in the same collection. The firewood behind the seated man looks very similar to the wood stacked next to the boardwalk seen in a previous post. Also visible in the background is a wooden frame for clotheslines with hanging laundry, and some fencing or netting, similar to the garden fencing and clotheslines seen before. 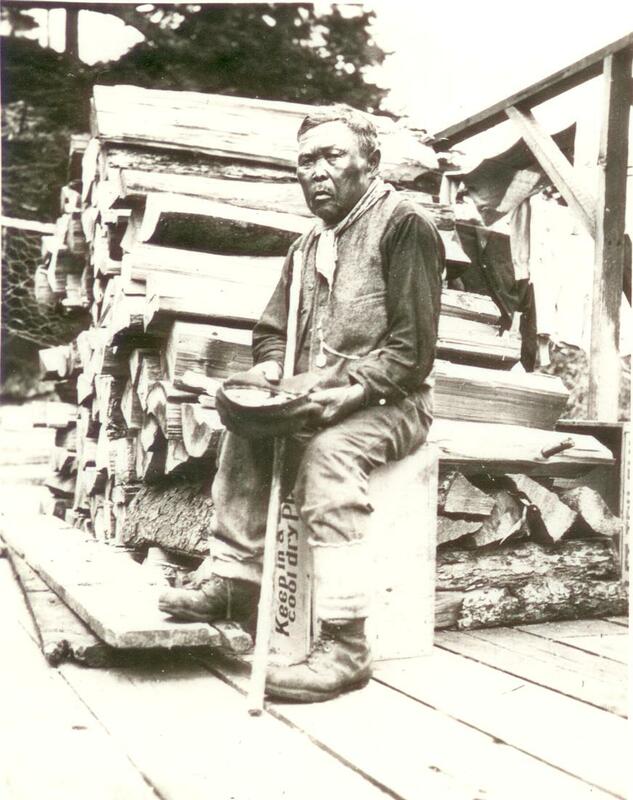 I suspect this fellow was one of the Tlingit Natives who worked at the cannery during the summers. 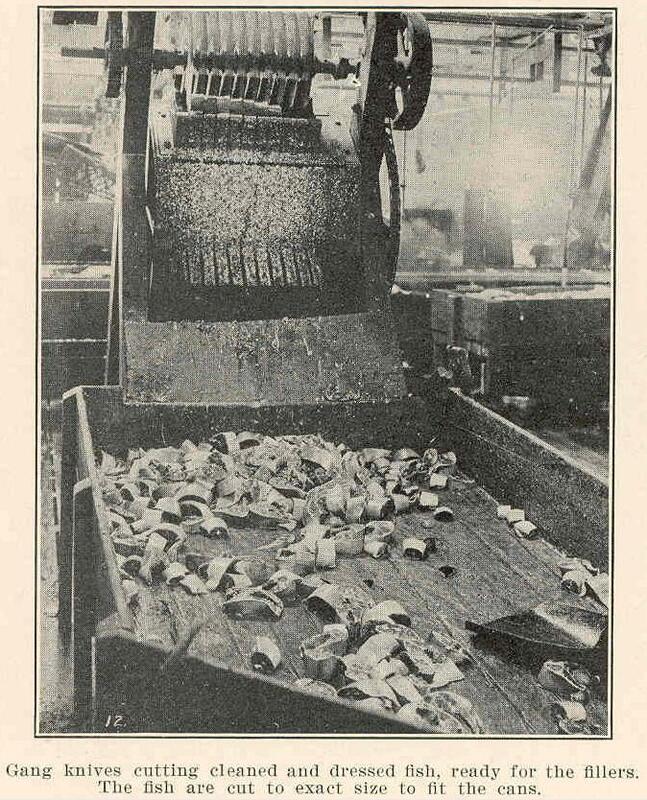 The next photo is labeled (in reverse) “Native Cannery Hands”. The photo seems to be printed in the correct orientation based on the product held by the small boy, reading “Sw… Pr…” (perhaps candy?). In a previous post I linked to a report indicating native children as young as 8 sometimes worked 9-hour days for 10 cents an hour. There is a lot going on in the above photo. The man on the right is making some sort of gesture or counting 3. The younger people are all looking at the camera and many are smiling, while the older woman stares away with a stern expression. 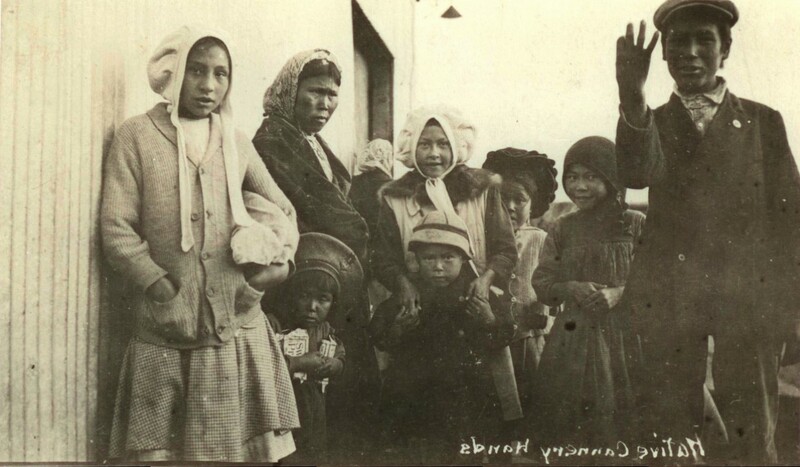 This phenomenon is noted in “The Tlingit Encounter with Photography” where author Sharon Gmelch points out that Tlingit women photographed at Funter Bay tended to look away from the camera unsmiling. One explanation is that smiling for a picture was considered disrespectful by elders. (As another side note, the 1907 photo of the Tlingit women apparently found its way onto a commemorative porcelain plate made in Germany in 1910, which is now at the Juneau-Douglas City Museum). Another notable feature of these 1920s photos is the popularity of hats or headgear. The children display a variety of hats, including what looks like a naval hat on the smallest boy (marked with a steering wheel at the front). The men unloading the ship mostly have caps, while someone in the hold and someone in the foreground seem to have fedoras (perhaps the bosses?). 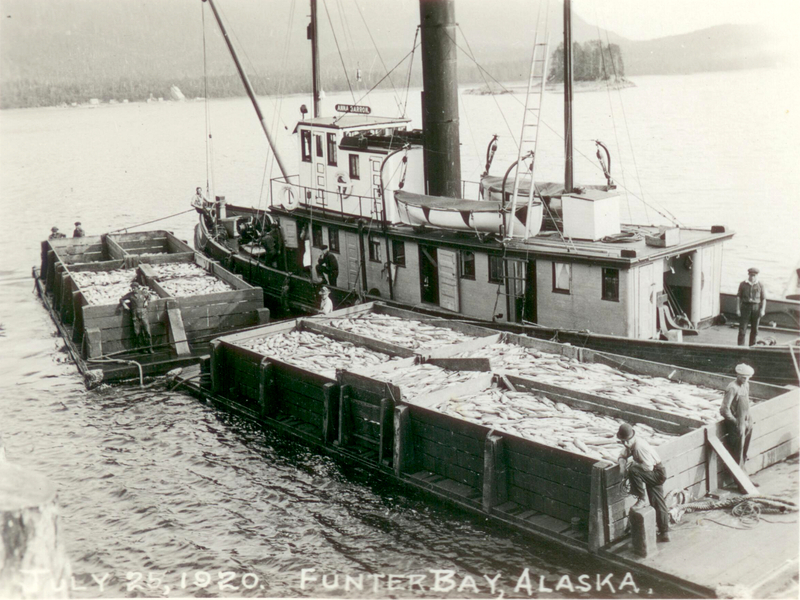 Earlier photos of Funter Bay workers also show a wide variety of hats, especially among the men. I am not sure if hats were universally popular among all Alaskans/Americans at the time, or if this were a local cultural habit. 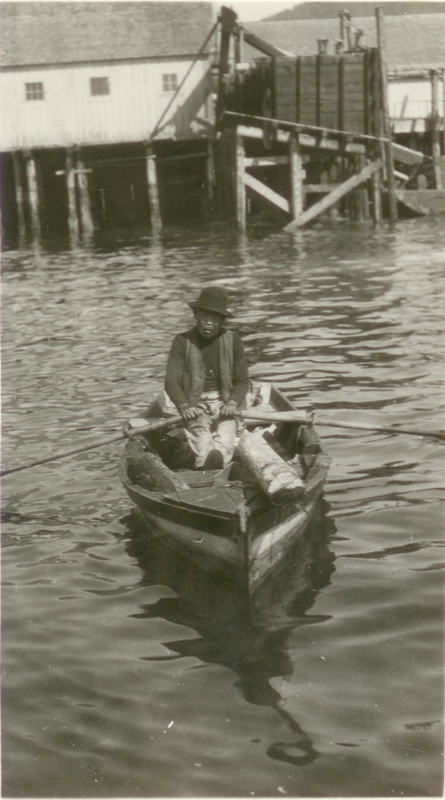 A man rowing a boat near the cannery may have been another cannery employee. He appears to have several cut logs in the boat, perhaps for firewood. 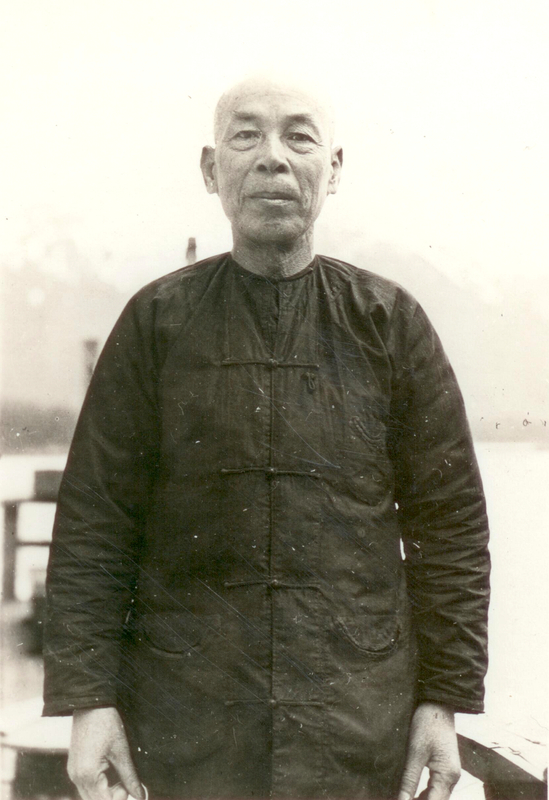 Another portrait shows a man of possible Asian heritage, standing on the wharf at the cannery (Mt. Robert Barron is barely visible behind him). He appears to be the only hat-less person in this post! 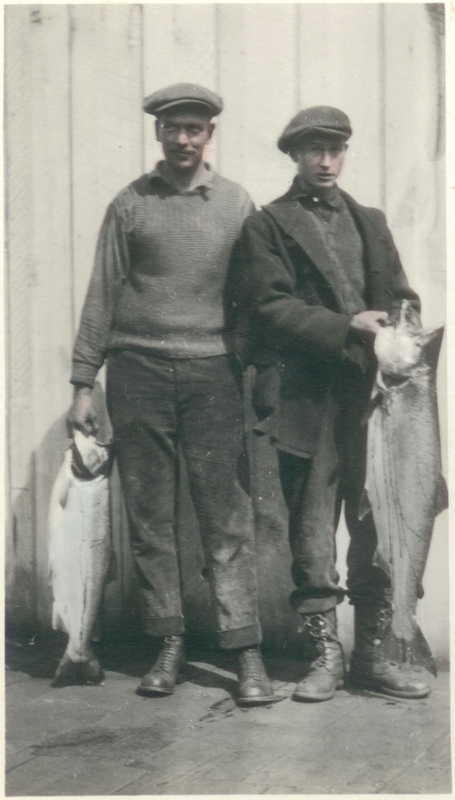 Several people are shown on the cannery wharf with fish in the photos below. These may be some Ballard (Seattle) High School students who visited Funter Bay in 1919, as the images were in the same batch and are colorized similarly to some photos of that group (to be detailed in a later post). And here we see a large halibut (probably in the 150-200lb range). 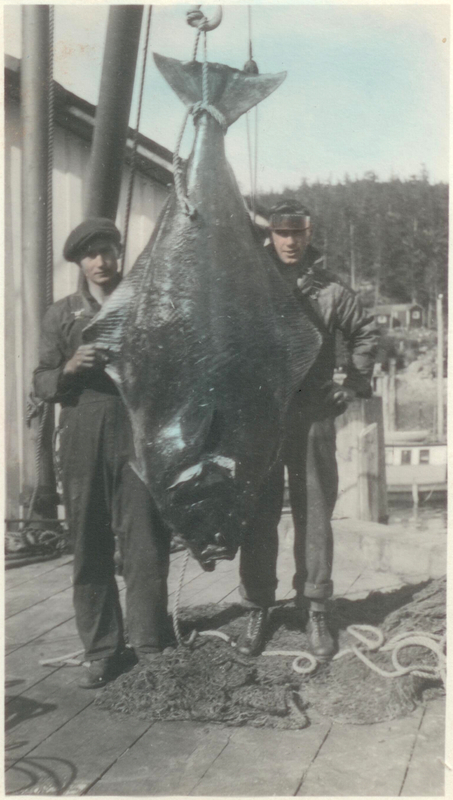 The men are standing on nets, but halibut are usually caught with rod or ground tackle (longlines). If any readers happen to recognize any of the people shown here, I would love to hear about it!